Myrtle Beach, SC – February 1, 2019 – Since its inception in early 2018, the Carney Strong Initiative has partnered with several companies to provide decontamination supplies to both suburban and volunteer fire departments throughout the country. In February 2019, Firewipes will join the Carney Strong Family of Product Partners for monthly donations. In October 2017, Battalion Chief Josh Carney passed away at age 41 from a brief but aggressive battle with Stage 4 Melanoma due to his occupation. To raise awareness of firefighter occupational cancer, his family partnered with Tonya Cronin, founder of Responder Wipes, to launch the Carney Strong Initiative. With the help of Brothers Helping Brothers, a non-profit organization, the initiative selects one volunteer or small municipal fire department each month to provide firefighters with educational materials and decontamination products. Carney Strong is excited to have Firewipes join their product partner family. Though the partnership begins February of 2019, Firewipes contributed greatly to Decontamination Day 2018. On October 19th, 2018, the anniversary of Carney’s passing, Firewipes, along with Responder Wipes, joined Carney Strong to collectively donate decontamination wipes to over 20 fire departments across the country to honor Carney’s memory and spread awareness. Firewipes is committed to providing the highest level of quality products that are specifically formulated and designed to aid in the removal of potential carcinogenic contaminants from exposure to hazardous environments. The idea of Firewipes began with a career firefighter, Creston. While on duty one day, he and his crew had back-to-back calls with no time to clean themselves or their rig. Creston realized the need for an on-scene disposable cleansing product that helps remove soot and other harmful contaminates from the skin. About Brothers Helping Brothers Many fire departments struggle to obtain the proper tools and equipment to effectively do their job. Brothers Helping Brothers is a 501(c)(3) tax exempt non-profit organization that assists small and/or rural fire departments obtain vital tools and lifesaving equipment through their grant program. About FireWipes Firewipes is committed to providing the highest level of quality products that are specifically formulated and designed to aid in the removal of potential carcinogenic contaminants from exposure to hazardous environments. About Responder Wipes Responder Wipes is dedicated to ensuring first responders minimize their risk of developing cancer from exposure to toxins, carcinogens, and contaminants in the line of duty. They are committed to providing quality on-scene decontamination wipes that are designed specifically for first responders. About Solutions Safety Products & Services, Inc. For over 20 years, Solutions Safety has proudly delivered the fire service industry with Citro Squeeze, today’s most widely used turnout, bunker gear, and PPE cleaner in North America to safely remove hydrocarbons from sensitive fabrics and surfaces. Now included in the SC products family is SC-14 to clean tools, equipment, apparatus, and work surfaces. About Last Line of Cancer Defense Last Line of Cancer Defense is a firefighter owned and operated company devoted to help prevent occupational cancer in the fire service through products, consultation, and education. In addition to Firewipes, the Carney Strong Initiative is also partnered with Solutions Safety Products & Services, Last Line of Cancer Defense, and Responder Wipes. Solutions Safety Products & Services provides “CitroSqueeze Turnout Gear Cleaners” and “SC-14 Station Cleaners” to firefighters; and Last Line of Cancer Defense provides “Activated Charcoal Decon Soap” that firefighters use when showering after a fire, as well as “Overhaul,” a natural supplement that aids in the detoxification after exposure. Responder Wipes also provides decontamination wipes. 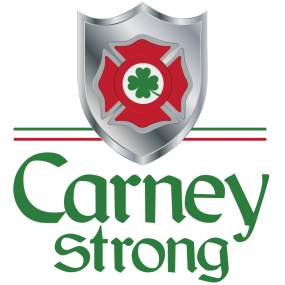 To donate to the Carney Strong Initiative or learn more, please go to www.carneystrong.org. The Carney Strong Initiative assists fire departments throughout the country with occupational cancer prevention through education and the donation of decontamination supplies. Our focus is on smaller fire departments in suburban and rural locales comprised of volunteer, combination, and career staffing. Our purpose is to help combat occupational cancer to ensure that firefighters go home to their family, so they don’t suffer at the hands of this dreadful disease.